This interview is the first in a series that will be a regular feature in Clearing. Check back each month for a new interview with a leading environmental educator in the Pacific Northwest. 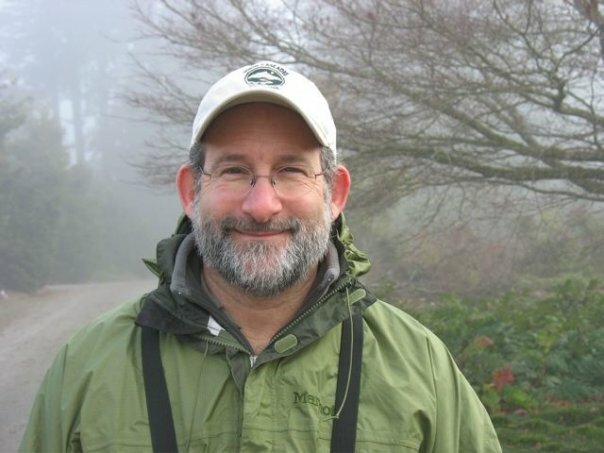 Saul Weisberg is executive director and co-founder of North Cascades Institute. He is an ecologist, naturalist and writer who has explored the mountains and rivers of the Pacific Northwest for more than 30 years. Saul worked throughout the Northwest as a field biologist, fire lookout, commercial fisherman and National Park Service climbing ranger before starting the Institute in 1986. He authored From the Mountains to the Sea, North Cascades: The Story behind the Scenery, Teaching for Wilderness, and Living with Mountains. Saul serves on the board of directors of the Association of Nature Center Administrators, the Natural History Network, and the Environmental Education Association of Washington. 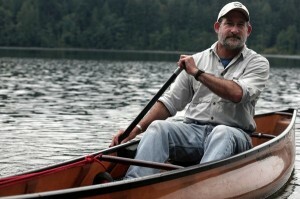 He is adjunct faculty at Huxley College of the Environment at Western Washington University. Saul lives near the shores of the Salish Sea in Bellingham, Washington with his wife and daughters. You were the co-founder of the North Cascades Institute in 1986 and have been its executive director ever since. What changes have you seen in the field of environmental education over the years? I’ve seen a big increase in the extent and rigor with which EE is pursued over the past 30 years. The various fields within EE (outdoor education, adventure education, conservation education) have blended and cross-pollinated each other. Now we see meaningful discussion of issues of social and economic justice, worker’s rights, and sustainability that bring even more people into the EE community. I’m inspired by the recent emergence of E3 Washington as a powerful force to connect educators, environmentalists and the business community. I think that’s the future of EE – to grow beyond environmental education into true, deep, interdisciplinary, education for all – good education that really makes a difference in our communities. How has the North Cascades Institute adapted to those changes? We started out as a field-based organization focusing on natural and cultural history. That’s still at our core. 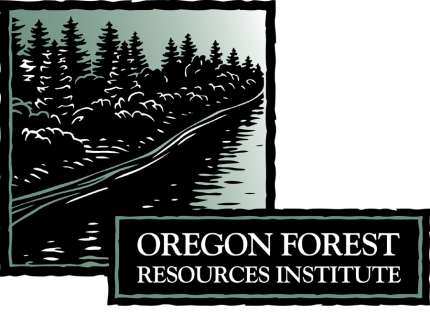 Our mission is to conserve and restore Northwest environments through education – so at heart we’re a conservation organization whose tool is education. That sets us apart from many of our peers, and influences how our board and staff look at issues. It’s not just about doing good education, it’s about effecting positive change on the landscape of home. We’ve been successful because we pay attention to the world as it changes around us. We listen to the scientists, pay attention to trends in public land management, learn from discussions by writers and bloggers. We’re always asking what’s the next thing that the public, and the schools, need to know. What do we need to pay attention to now, in 2010? How did the recession affect the activities at NCI over the past couple of years? Well it scared us into paying attention even more than we normally pay attention – which is quite a lot. Early in 2009 the schools were really worried about the state budget and we had a fairly significant number of schools pull out of spring programs. Our leadership team at the NCI met every Monday throughout the year, looking at trends, refocusing prioritities, and keeping close watch on the budget. We didn’t fill a couple of positions we would have filled in a normal year, and had to pull back in some other areas to focus on our priority youth programs. And we had a two-week unpaid furlough for all staff at the end of the year. The result of all this was that we ended the year really strongly – in the black, with several new initiatives successfully launched, and with a stronger staff and programs than when we began. Tell me about some of those new initiatives at NCI. What are people excited about these days? 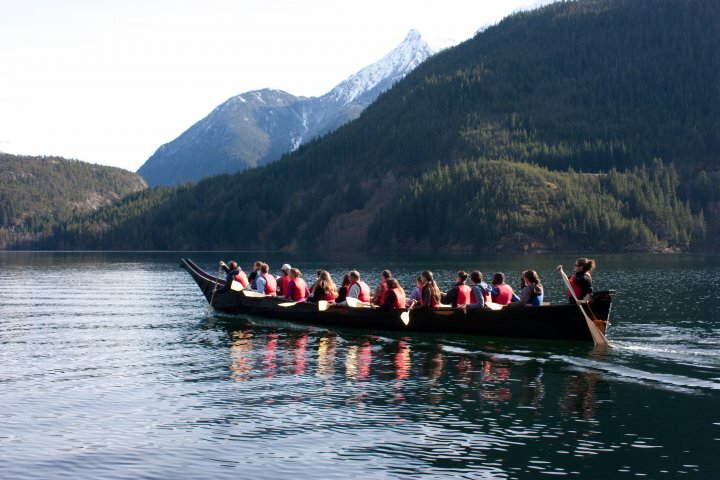 I saw that you have recently acquired a 36-foot Salish canoe. It’s a thing of beauty, by the way. The new canoe is a beauty. It’s a traditional Salish design in fiberglass, holds up to 18 paddlers, black hull, “oxblood” interior (it was made in Canada and that’s what they said). 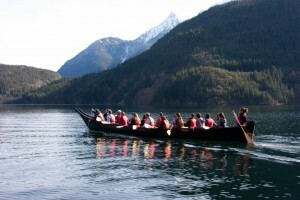 I love these big canoes. You can have a really diverse group in them, big people, small people, people in wheelchairs, and everyone is pulling together, talking and laughing, and seeing the world from a different perspective together. The other project which we piloted in 2009, is “Cascades Climate Challenge.” Last year we brought 20 kids (4 each from DC, Chicago, Denver, SF and Seattle) to the North Cascades for 33 days to study climate change. Then they went home to begin field projects with their high schools and partner elementary schools. Then we took them to Washington DC for a week to meet and share with government officials. It was very, very powerful. We’ve got a bunch of videos up on our website about all of these programs. This year it’s expanding into 2, 3-week programs for a total of 40 kids, but all from WA and OR. Got to reduce the carbon footprint of a climate program…. Speaking of which, are you seeing evidence of climate change in the North Cascades? The North Cascades have more glaciers than any other area of North America outside of Alaska. And they are dramatically shrinking. Mountains that I climbed 30 years ago now show rock and snow where there used to be ice. We’ve developed programs to focus attention on the challenge of climate change, and how human communities will have to adapt. These summer programs for high school students are some of the most exciting and rewarding work I’ve ever done. Are you concerned about the seeming growth in anti-science, climate change-denying elements in society? There always will be people who don’t want to think for themselves, or believe what the facts are saying. I think it’s worth engaging with them, to a point. We try to keep our focus on education, sharing information along with the affects of that knowledge on society. If we know something is threatening the planet we have an obligation to speak up, but also to be compassionate towards others who don’t agree with us. Issues like climate change will be with us forever. It’s worth taking the time to get it right. But we can’t take too much time. What do you think the future holds for non-formal education centers like NCI? A recent editorial in the journal Nature pointed out that much of what people know about science is learned informally through time spent in the field, at nature centers, museums, zoos and aquaria. It goes on to say that education policy-makers should take note. We’ve been taking note of that for years. People learn best through deep, intimate experiences in nature. That’s what all of us in EE strive to provide. What gives you the most pleasure in your role as Director of NCI? Working with people. Making a difference. Seeing people get turned on by something they learn at one of our programs. Bringing in a big grant. Getting a clean audit. Hanging out at the Learning Center at Diablo Lake on a spring evening with a glass of wine, watching peregrine falcons soaring along the cliffs. I go paddling on one of our local lakes in my 16’ solo canoe. It’s a quick way for me to reconnect with what’s blooming, which birds are singing, and with myself. This time of year the canoe often lives on top of my car. I do spend less time in the backcountry than I used to, and that bother me. This is the year for that to change. I need to get back into the high country. Do you have a favorite place in the Pacific Northwest to visit? Let’s see – mountains, rivers, ocean, eastside, westside… it’s all my favorite place. But I do love the northern stretches of the Olympic coast, any high ridgeline in the North Cascades, the Pasayten Wilderness, Malheur and Steens Mountain in Oregon. It has been noted that most the great naturalists and nature writers could point to events in their childhood that led to their affinity for nature and their future work on environmental issues. What was your first nature experience that influenced your life? Camping with my family at age 6 in Algonquin Provincial Park. We started a family tradition of spending 5 weeks each summer camping in parks throughout the US and Canada, often going back to the same place year after year. Those places became home to us, we stopped being tourists and felt like we really became part of the land. Who is/are your environmental hero(es)? Everyone who is looking at birds and bugs and flowers, teaching kids, and challenging themselves and each other to get busy and save the world. We’ve all got to pull together. The Collected Poems of Kenneth Rexroth, Wild Comfort, the Solace of Nature by Kathleen Dean Moore, and Insectopedia by Hugh Raffles. I think most of us understand what he was talking about. In my mind, a good day is when we can do both – savor and save the world. I like to think that’s our job.